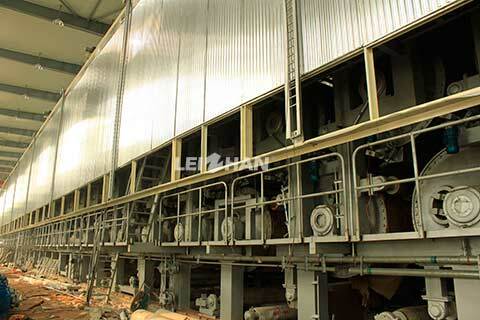 In approaching system, paper pulp must be cleansed and screened to be homogeneous slurry suspension liquid, and then it can steadily feed pulp. Approaching system has significant function on improving paper eveness, cleanliness and improving work speed. There are three approaching systems for Craft paper and T-paper making: top layer, medium layer and bottom layer approaching system. Each approaching system includes: finished Pulp chest & fan pump, pulp concentration and sizing pulp control system, white water barrel, fan pump, inflow pressure screen, vibrating screen, head-box,and the relevant pipes, valves etc. White water barrel is the most important part in approaching system. It is mainly used for collect the white water from paper machine wire section. It can release free gas from white water and provide a stable pulping conditions for fan pump. 3. Reduce the paper making process fluctuation.